It’s been over two months since I blogged. I know, that’s not how to run a blog, because with blogs, consistently delivering an interesting read is what it’s all about. I do tend to come and go a bit – especially during the fall. Last time I posted, I was beginning my big drive back to Minnesota. On the way, I stopped to visit my brother and his family in British Columbia. Ten days later – I was delivering my mothers RV down to the gulf coast of Florida, just northwest of Tampa Bay. Thats North America, corner to corner, in just a couple of weeks! I’m back to work here in MN, doing therapy, and spending as much time at is as I care to. When I’m not working, I’ve been doing some hunting, fishing, trapping, and spending quality time with friends and family. The only thing missing is my wife, Maria. Meanwhile, Maria has been busy up in Homer, working on getting long-term renters for the winter, taking in random reservations, teaching zumba classes, and of course, helping people with her DoTerra Oils. Maria is preparing to have all four of her sons home for Christmas! I think it’s been a long, long time since that has happened, and I’m sure she is looking forward to that. Good news is, right after Christmas – she and the two knuckleheads (Brody and Blue) will be coming here to be with me in Minnesota for January, February, and part of March. That will be her longest stay to date. Major changes for this winter include a new purchase here in MN: Maria and I will be living in a 26 foot “Ice Castle” at least part of the winter. That’s a nice trailer that can be used winter or summer, on the ice, or on land. It should be interesting having three dogs in a 26 foot trailer – but, enjoying dogs as much as we do, I’m sure it will be ok.
Three dogs, you say? Yes, that’s another change! For a long time, I’ve been wanting to get “my own” dog (Brody and Blue, though I love them, are Maria’s dogs). My dog is “Sam Elliott” – named after the movie star – known best for his western characters. 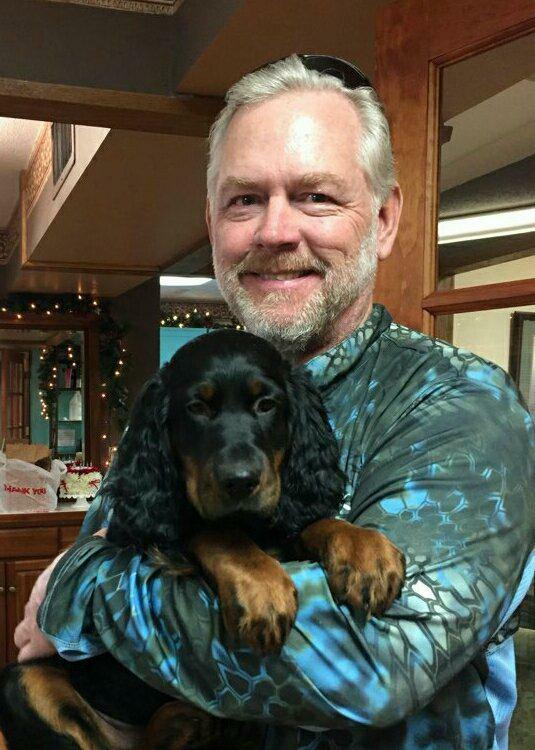 Sam E is a Gordon Setter, black and tan in color, and should be an excellent hunting dog. I’ve been taking him with me wherever I go, and he has been coming along nicely with his training. Reservations for 2018 are coming in – both for the bed and breakfast, and for adventures with me on the bay. Many guests are inquiring and researching, and will “pull the trigger” in January, when things settle down after the holidays This is traditionally when reservations really start to pour in. If you’re thinking of coming and staying with us, best to check your vacation time and dates, and check our calendar to be sure you get your preferred space. Same with Majestic View Adventures. June 15-August 15 is busy, busy – and I expect to be on the ocean with our guests almost every day. Many who stayed with us at the B and B in 2017, and many who went out in the boat with me – sent photos and videos of our adventures. Between now and May, I intend to begin including them in my blogs, and writing about our experiences. Watch for close encounters with Orcas and Whales, non-stop action while salmon fishing, a battle with a giant halibut, a monster bear hunt, puffins, otters, seals, eagles, and more! I will leave you with a recent photo of myself, and Sam E.
Tim, Maria, Brody, Blue, and our new arrival Sam E.